January 23, 2019 – The Kevin L. Thomas, MD Scholarship will be awarded to high school students interested in medical careers. The DCRI’s Kevin Thomas, MD, has devoted his career to eliminating disparities for patients with cardiovascular disease and helping junior faculty from underrepresented populations advance their medical careers. Thomas’ efforts will now extend to high school students thanks to a new scholarship that has been established in his name. The Kevin L. Thomas, MD Scholarship will benefit participants in the Health Professions Recruitment and Exposure Program (H-PREP). H-PREP, which has programs at medical schools nationwide, introduces high school students from underrepresented populations to careers in the health sciences. 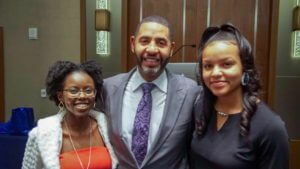 The scholarship will allow H-PREP administrators at Duke to increase the amount of money provided to each participant. 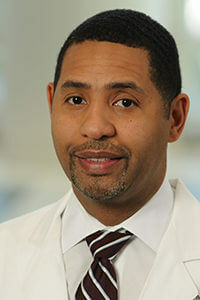 Thomas, who serves as assistant dean for underrepresented faculty development at the School of Medicine and director of faculty diversity and health disparities research at the DCRI, said that at each step in his own career — from medical school to residency to a fellowship to becoming a faculty member — he has identified mentors and been supported by a network of peers. In 2017, Thomas launched a yearlong program to provide professional development for historically underrepresented groups. The first cohort in the program, called Academic Development, Advocacy, Networking, Coaching, and Education for Underrepresented Populations (ADVANCE-UP), was composed of 13 faculty from eight different departments. Most of the participants were Hispanic, Latino, or African-American, and 11 of them were women, which Thomas said fostered important discussions about the intersection between race, ethnicity, and gender. At the December closing banquet for the program, the cohort had a surprise for Thomas — they had all contributed to establish a scholarship in his name. ADVANCE-UP participants contributed $1,500 to the scholarship, and Duke School of Medicine Dean Mary Klotman matched the funds for a total of $3,000. Gianna Hammer, PhD, an immunologist who has worked at Duke for five years, was a participant in the ADVANCE-UP program. She said the cohort wanted to think of a meaningful way to honor Thomas and all that he has worked for. Jennifer Dominguez, MD, another ADVANCE-UP participant and an obstetric anesthesiologist who has been at Duke for six years, said the group chose H-PREP because the program furthers Thomas’ mission. The first year of the scholarship funding will be distributed among the top three H-PREP students, who were evaluated on their performance after a series of interviews and a presentation. Rita Kibicho, a current high school senior who wants to go to UNC-Chapel Hill, Duke, or Brown, set aside the money she received in her bank account, where she looks forward to using it on books for her first semester. “I’d like to thank Dr. Thomas and everyone involved in H-PREP for recognizing the lack of support for younger people interested in medicine and trying to give us the exposure that will help them make tough decisions once they get to college,” she said. Gianni Lacey-Howard, another scholarship recipient, will attend Duke on a full ride from another scholarship, but she said the Kevin Thomas, MD Scholarship will help her with miscellaneous costs associated with college. Lacey-Howard intends to pursue a career in emergency medical services, a decision she made thanks to her experiences in H-PREP. “I know that medicine is the place I want to go because I enjoy helping people, and EMS is the best fit for me because I enjoy fast-paced thinking,” she said. Thomas said recruitment for the second cohort of ADVANCE-UP is currently underway. Meanwhile, he is continuing his research at the DCRI on health disparities.